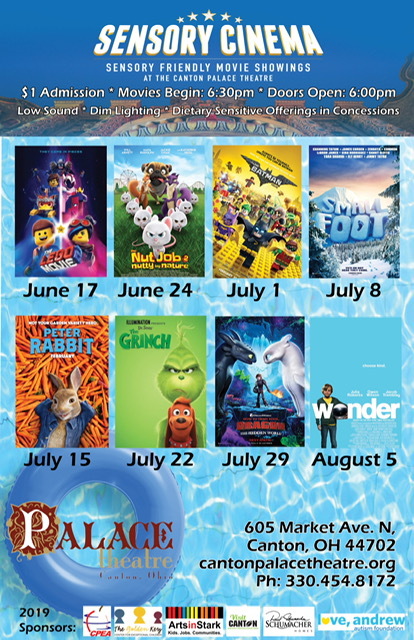 The Canton Palace Theatre, Schumacher Homes, Canton Professional Educators Association, Golden Key Center for Exceptional Children and Q92 Radio in conjunction with the Love, Andrew Autism Foundation presents the eight-week movie series Sensory Cinema. The movies will begin at 6:30pm, with doors opening at 6pm. Admission is $1.00 and group reservations are available by calling 330-454-8172 up until noon on the day of the movie. The mission of the Love, Andrew Autism Foundation is to create communities of compassion in which personalities flourish, friendships blossom, and futures are fostered, allowing children with autism to live their best lives. The Foundation is instrumental in putting in place The Star RoomTM in local schools, as well as inclusion and acceptance programming. For more information on the Love, Andrew Autism Foundation and The Star Room, visit www.loveandrew.org. Completed in 1926, the Canton Palace Theatre is a downtown architectural jewel registered on the National Historic Registry. A prized community venue for classic, contemporary and art films, The Palace annually hosts more than 300 special events, concerts, recitals and Broadway-style productions. For more information, please visit http://www.cantonpalacetheatre.org. The Palace is located at 605 Market Avenue North in Canton, Ohio. Business and box office hours are Monday through Friday 10:00a.m. to 4:00 p.m. Business offices can be reached at (330) 454-8172 and a 24-Hour Recorded Event Information line is (330) 454-8171.